This year we grew one cucumber plant, and it’s been producing so many cucumbers that we can’t eat them fast enough! I decided to turn the cucumbers into dill pickles using this Dill Pickle Recipe. This recipe makes them taste so good! Thanks to a friend for sharing this recipe with me. This brine recipe makes 12 pints of dill pickles. Prepare pint jars by washing them, and then keeping them in hot water in the sink until you are ready to use them. Prepare the hot water bath canner by filling it with water and start to heat it up. Thoroughly scrub the cucumbers in water. Cut them into spears or slices depending on what you want. Make the brine by placing the water, vinegar, and salt in a pot and heating it until the salt is dissolved. Place one sprig of dill and one garlic clove in the bottom of a pint jar. Then pack the jars with cucumbers. Pour the hot brine over them leaving ½ inch head space. Run a spatula gently between the cucumbers to release air bubbles. Wipe the top and threads of the jar with a damp cloth. Place a lid on top that's been sterilized in hot water. And screw down band. As each jar is filled, stand it on a rack in the hot water bath canner. Once all of the jars are on the rack in the water bath canner, place the rack into the water. If needed, add more hot water to cover the jars 1-2 inches. Place cover on canner. Bring to a boil and process pints for 20 minutes. 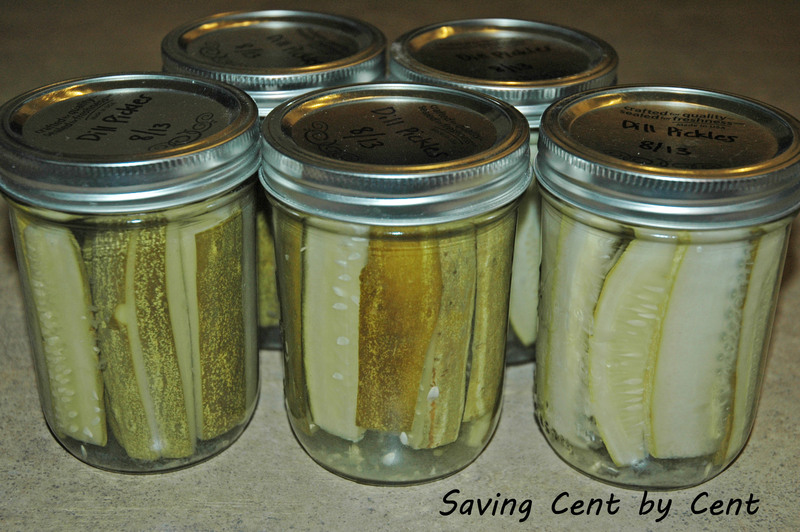 Remove jars from canner and set on a cloth placing jars several inches apart. Allow jars to cool. Remove bands and test the seal. Wash outside of jar surface, and store jars in a dry, dark, and cool place. This recipe was adapted from Food.com.